When Catherine and I were working on our Art in the Open project we ran into one big problem… affordable stuffing for all of thecreatures we were making. They were just so many or them, and they were so big, we were going through bags of stuffing like crazy (that stuff’s not cheap!). Catherine came up with the brilliant idea of going out to MacAusland’s to buy some unwashed fleece. They sell it by the pound, it worked out to be cheapest way. While she was out there she also picked up some bags of their blanket ends, they sell them in giant bags for $10.00. When I saw them all I could think about was making something out of them. I’ve been coveting a MacAusland’s blanket since we moved to PEI. Their wool is soooo warm and soft and cozy… and the colours, so pretty. It was hard, but I didn’t touch them until we finished everything for the show. 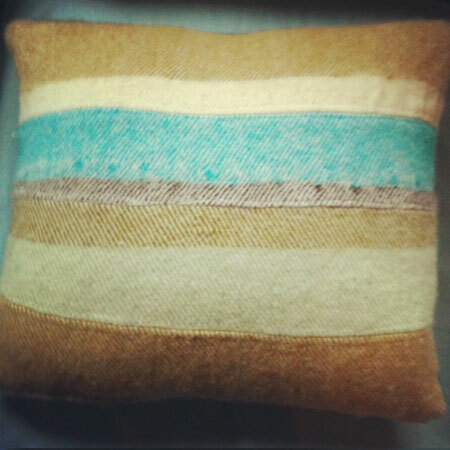 With some the pieces that we had left over I decided to sew some into pillows. I love how these turned out. ** I’m LOVING all the favourite summer moments comments. Thank you all who shared. I will post the winner tomorrow.